A recent economic impact study commissioned by Education New Zealand reveals a big jump in international student spending in New Zealand over the last two years. The report, produced by Infometrics and the National Research Bureau, shows the value of international education rose to NZ$4.28 billion in 2015/16 (US$3.1 billion). This breaks down into NZ$4.04 billion in spending by foreign students studying in New Zealand and a further NZ$242 million arising from educational services delivered offshore. It also represents a striking 50% increase over the last economic impact estimate for 2013/14, when the country’s international education sector was valued at NZ$2.85 billion. The higher valuation has been driven in part by two consecutive years of double-digit growth in foreign student numbers, with total enrolment exceeding 125,000 students in 2015. In fact, year-over-year growth in foreign enrolment in New Zealand reached 13% per year from 2013 to 2014 and again from 2014 to 2015. On the strength of that growth, as well as increasing spending on living costs by international students, international education is now New Zealand’s fourth-largest export sector, behind only dairy, tourism, and meat exports. And as such it now supports about 32,000 jobs throughout the New Zealand economy. 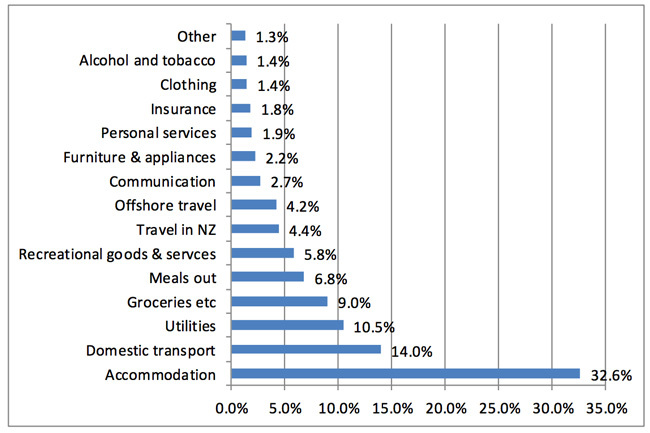 As the following chart reflects, more than half of onshore international education spending rests with the university sector (27.9%, or NZ$1.13 billion) and private training establishments (27.2%, or NZ$1.1 billion). 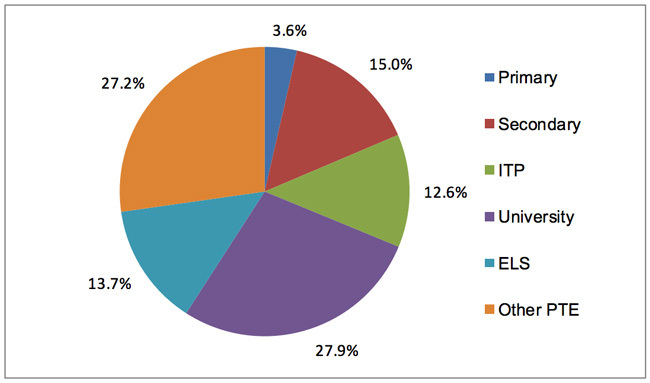 English language providers (ELS in the chart below), secondary schools, and institutes of technology, polytechnics, and wananga (ITP) account for roughly equivalent shares of the balance of spending for 2015/16. 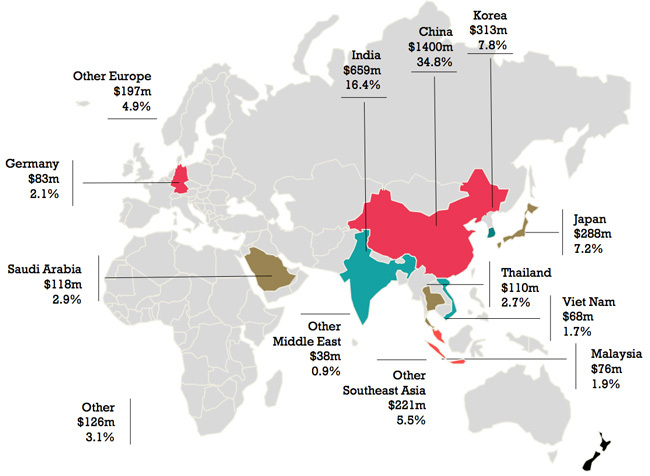 In terms of source markets, China remains by far the biggest contributor to onshore spending, accounting for nearly 35% of sector revenues in 2015/16. India is the next largest export market for New Zealand educators, with 16.4% of onshore spending for the year. Factor in Japan and South Korea – each with more than 7% of total spending – and New Zealand’s top four markets accounted for nearly two-thirds of all export revenues in 2015/16. As we noted in an earlier report, it happens that foreign enrolment in New Zealand has become more concentrated over the past several years, and this in spite of coordinated attempts to open new sending markets. This is partly the result of significant growth in the Indian market, but it also reflects a decline in a number of established source markets over the same period, including South Korea, Saudi Arabia, Thailand, Japan, and Germany. 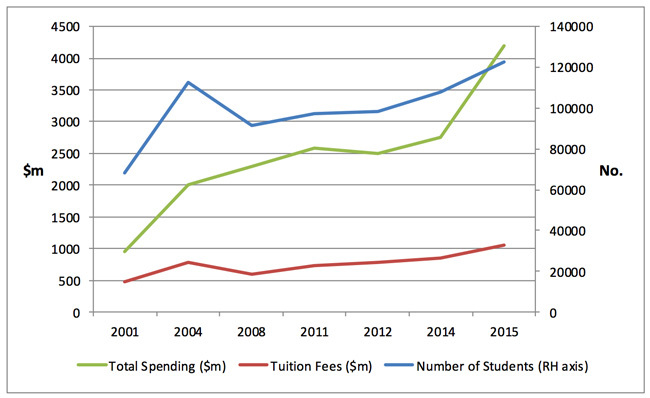 The following chart reflects growth in student numbers, tuition spending, and total spending over the last fifteen years. The significance of increasing housing costs for foreign students is illustrated in the chart below, which indicates that accommodation accounts for about a third of all non-tuition spending. This entry was posted in Australia/Oceania, New Zealand, Regions and tagged student recruitment, international students, study abroad, education spending in China, student enrolment.